Barcelona clinched the La Liga title on Sunday evening after beating Atletico Madrid 1-0, and few can doubt that the trophy isn’t deserved to have returned to the hands of the Spanish giants. Lionel Messi scored the only goal of the game at the Estadio Vicente Calderon to seal their status as Spanish champions in style. With Real Madrid struggling to maintain consistent form in the second half of the season, Barca have commanded the position at the top of the table, and haven’t looked like relinquishing their lead – especially with formidable attacking trio Neymar, Luis Suarez and Lionel Messi in stunning goalscoring form. Luis Enrique’s men could add two more trophies to their cabinet before the close of the season with the Copa del Rey final and the Champions League final to come. 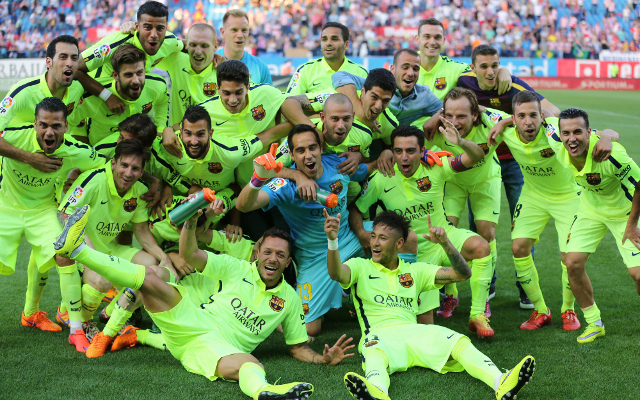 Congrats to the best team in world football… Barcelona are champions of Spain! Been fantastic watching them this season. Barcelona win La Liga for 23rd time – the 7th time in 11 seasons. #fcb on the brink of an incredible treble. Congratulations Barcelona, great fight, fully deserved. See you next season. In January Barcelona were falling apart due to suspected internal mutiny. How they have risen to the occasion! There is no team more deserving than Barcelona to win the treble this season..